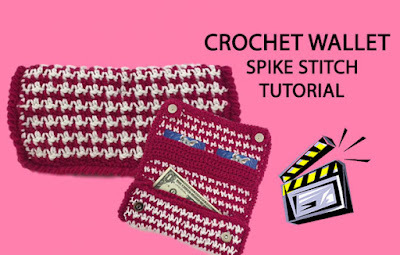 Materials: crochet acrylic yarn (pink&white), 5mm crochet hook, 2 magnetic buttons. Row 1: 1sc into the 2nd chain from hook, *1dc into the next chain, 1sc into the next chain*, repeat from * to * across until 1 chain remains. Row ends with 1dc (change color). Yarn over and insert your hook into the last chain, yarn over an pull through a loop ( 3 loops on your hook), yarn over and pull through 2 loops, grab the white color and complete a dc. Row 2: chain 1, turn, 1sc into the 1st stitch, *1dc into the next sitch, 1sc into the next stitch*, repeat from * to * across until 1 chain remains. Row ends with 1dc (change color). Yarn over and insert your hook into the last chain, yarn over an pull through a loop ( 3 loops on your hook), yarn over and pull through 2 loops, grab the white color and complete a dc. *Change color in the end of each row. *In the end of row 35 cut the yarn and finish your work. Row 2: chain 1, turn, 1sc in each chain across. *In the end of row 10 cut the yarn and finish your work. *In the end of row 9 cut the yarn and finish your work. *Sew the pocket with the sides. Grab the side and fold it, sew the pocket in the middle starting from 2nd row of side. Do the same to the other side. *In the end of row 6 cut the yarn and finish your work. *Place the buttons into the covers. Grab the cover, count 10 rows from the beginning and fold it, place the pocket inside, count 6 rows and place the card holder, place the buttons in both corners. Round 2: start working the shrimp stitch. 1shrimp stitch in each sc around. *In the end cut the yarn and finish your work. *sew the card holder's bottom to the cover and the middle part. *place the buttons into the fold part. You can watch our video tutorial witch shows you how to make this lovely wallet step by step.